I am learning more every day about one of the most important things it takes to be effective in prophetic ministry. This thing applies whether you’re just one man or woman ministering to one person in your living room, or whether you’re some famous prophet ministering to droves of people in a prayer line. This one ingredient–a heart attitude, really–is, I believe, the biggest thing that makes prophetic ministry successful. It comes right after hearing God (without which prophetic ministry is impossible anyway). 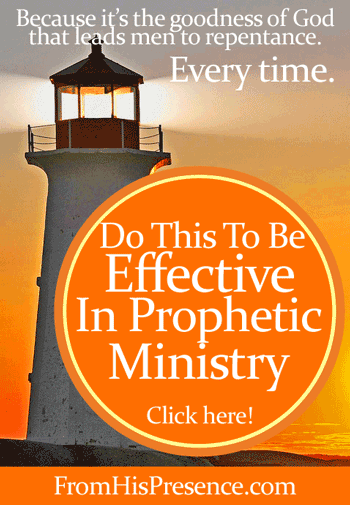 Want to know this secret to prophetic ministry? The thing that will change both you AND your ministry forever, if you just get hold of it? Let everything you say and do be governed by the fact that it’s the goodness of God that leads men to repentance. This Scriptural truth is a not-so-secret sauce that can be easy to forget sometimes. When you’re working with people who are broken and hurting–whether they know Jesus or not–a person can be tempted to see them with your eyes of flesh, not with the eyes of God. Because it’s not our opinions that lead men to repentance. It’s not our criticism that leads men to repentance. It’s not pointing out sin that leads men to repentance. And it’s definitely not shame and condemnation; shame and condemnation never healed anybody. But the goodness of God will lead people to the feet of Jesus every time. God’s goodness is what led me to the feet of Jesus. When I was lost in sin, the Holy Spirit drew me and empowered me to answer His call. I didn’t deserve it and still don’t, but He didn’t condemn me. Instead, He wooed me with His goodness and love. He showed me the beauty of Jesus and of Jesus’ atonement for my sin. And because He is so good, He compelled me to the foot of my Savior, where I found salvation, hope, and healing. If you think back to the moment of your salvation, you’ll know that He did the same for you. For when we were still without strength, in due time Christ died for the ungodly. For scarcely for a righteous man will one die; yet perhaps for a good man someone would even dare to die. But God demonstrates His own love toward us, in that while we were still sinners, Christ died for us” (emphasis mine). God is good, even when we don’t deserve it. It’s not merely because He wants to be good; it’s because goodness is WHO HE IS. It is not possible for Him to be anything BUT good. So what does this look like in hands-on prophetic ministry? It means your job is to edify, encourage, and build up. Every time. Your job is to speak life into them. Your job is to point the way back to the Father’s table. Your job is to see that person with the eyes of God. Your job is to call forth the purposes of God in their life, and command those purposes to manifest. Your job is to shine the light of hope into every dark situation. To convict someone of sin; that’s the Holy Spirit’s job. Your job is not to accuse; we are not the accuser of the brethren. Your job is not to condemn; there is no condemnation to those who are in Christ Jesus (Romans 8:1). When you’re ministering to someone, even if that person is mired in the depths of sin, you point the way to Jesus. You point the way to the forgiveness available to every one of us through Christ’ death on the cross. You point the way to the victorious life that Jesus lived, died, and rose again to give us. And if you stare at Jesus long enough yourself, ministering God’s goodness will be easy. You won’t be able to do anything else. Even in someone’s darkest hour, you’ll see the light of God in their situation. Even when they feel their ugliest, you’ll see the beauty in them that Papa sees. Even when they see no hope for themselves, you’ll be overjoyed with the hope of Christ in their situation. You’ll be consumed with God’s love and heart for everyone you see, and you’ll only be able to speak out of that love and heart. Christ in you truly is your hope of glory (Colossians 1:27). He brings love, hope, healing, forgiveness, victory, and glory, every time. Now, this blog post isn’t meant to discuss every nuance of discipleship, so please don’t start thinking “That’s not true because we can’t ignore sin!” Nobody ever said anything about ignoring sin. But even when you address sin, you can do so the way God does. He calls sin sin, but He points the way to forgiveness, new life, and restoration in Christ. He does so because He’s good, and He’s merciful, and His mercies are new every day. Every day is a do-over when you know Jesus. It’s true for you, and it’s true for every person you’re ministering to. So point the way to God’s goodness. It’s His goodness that brings repentance. His merciful touch is what brings lasting change. His Word is what heals (Psalm 107:20). His anointing is what breaks the yoke (Isaiah 10:27). It’s Him. It’s all Him, and He does it because He’s good. How does this impact your perspective of prophetic ministry? Please leave a comment below; I’d love to hear your thoughts! Image courtesy of Dennis Jarvis on Flickr via Creative Commons license. Image has been edited and graphics added. I appreciate your teaching this morning. As I responded to Judy Douglass, my analytical approach is often misinterpreted as criticism. In the crises I am facing right now I have to build up, not challenge. Thanks for your timely teaching. I have been following your outpouring since before New Years and have found it very helpful. I cannot go into detail yet, but heartfelt thanks for what you are doing. Hi Laurna, thank you so much. I’m so sorry it has taken me so long to reply. (I’m way behind on blogging.) 🙁 Anyway, I am thrilled that our Papa God is using these articles to encourage you. That’s really what it’s all about. I pray He would continue to lead and guide you, and bring you out of whatever you’ve been going through into a broad place… and that He would make you glad in proportion (double, in fact!) to all the tears you’ve sown. Blessings to you, Laurna! Thank you for reading and for sharing! Thank you for sharing this! I once heard someone say that the main function of a prophet is to hear and pray, not speak. Speaking is secondary. This has been a huge blessing to me. No matter how powerful a word of truth, horrible delivery can ruin it. I’ve learned to listen carefully to the Holy Spirit on whether or not to share a word for someone and the EXACT words, non-verbal communication, and tone that I should use to deliver it. That’s awesome, Kalyn. Yes, we must hear and pray before we speak anything… and the majority of what we hear is for praying, not sharing. Sharing must be done carefully. I totally agree with you! Thank you for reading, and for sharing your thoughts! Have a great day!